We’re halfway through the season, so let’s play some mock draft games. As always, the player evaluation process is ongoing, but it’s a good way to get an idea of where players might fit in come next April. One important note: the draft order is simply based on Vegas Super Bowl odds and not a prediction of what will happen the rest of the season. Also, this mock draft is about what I would do as GM with each pick, not a prediction of what each team will do. 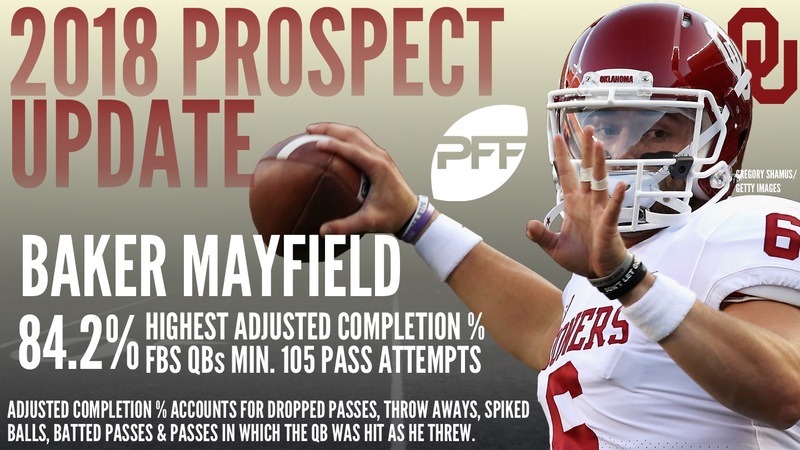 Cleveland drafts the nation’s top quarterback in Mayfield, who continues to impress no matter which way his game is dissected. He has the top PFF grade for the second year in a row at 95.8, as he uses his natural playmaking ability to attack all levels of the field with accuracy. There are still some questions coming out of a favorable Oklahoma system, but Mayfield has shown that he can succeed in every situation and he may just be the guy to turn the Browns around in the future. 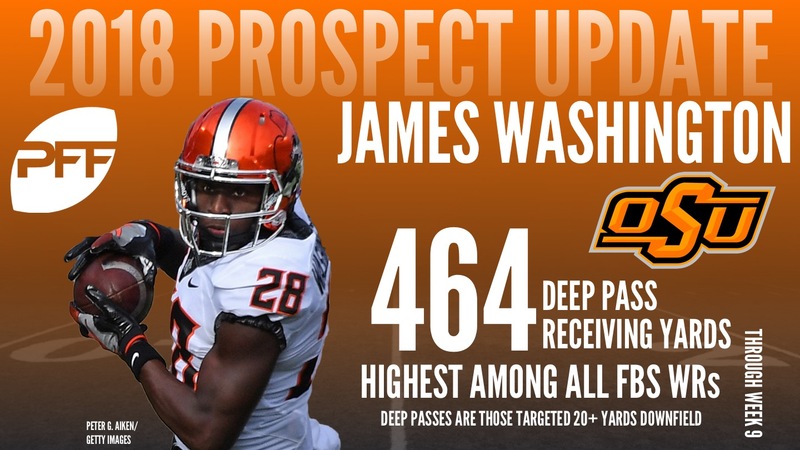 After trading for QB Jimmy Garoppolo, the 49ers may be able to grab the best non-quarterback at the top of the draft, and from a pure value standpoint, James is the guy. 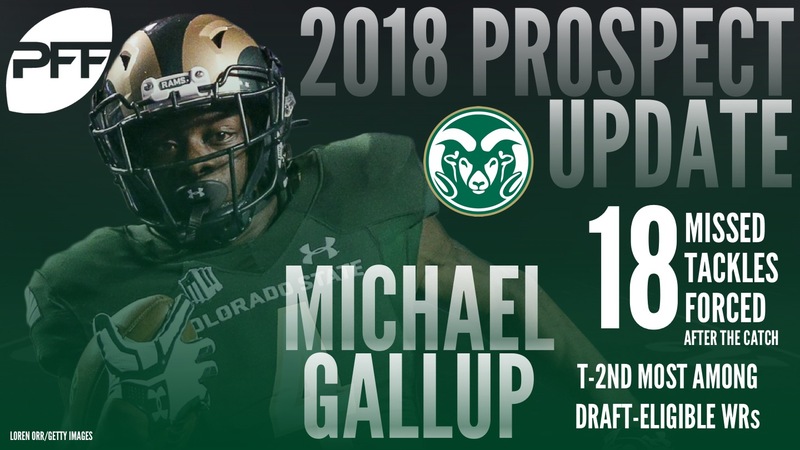 His versatility is tailor-made for the NFL, as he can make an impact at all levels of the defense, from deep safety to playing at the line of scrimmage, and he gives the 49ers a playmaker in the secondary after leading the nation with a 91.2 grade as a true freshman in 2015 and currently ranking sixth at 87.4 overall. While the Colts have a number of holes to fill, Barkley is a three-down option, as he can make an offensive line look good in the run game and his big-play ability must be accounted for in the passing game. He leads the nation’s running backs with 471 receiving yards, and he adds a weapon for QB Andrew Luck as the Colts look to rebuild both sides of the ball with impact players. The time is right to look to the future at quarterback for the Giants and despite Darnold’s struggles this season, he has shown plenty of NFL ability during his year-and-a-half as starter. He’s forcing too many passes into coverage this season and his fumbles are concerning, but Darnold’s ability to work the middle of the field with anticipation bodes well for the next level. Quarterbacks continue to come off the board as the Jets look to shore up their future with Jackson, who has improved as a passer every year in college. 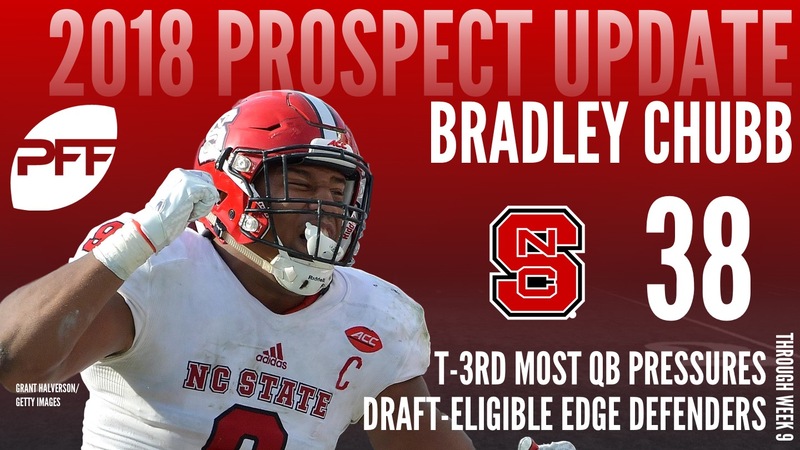 He also has dynamic athleticism, leading to the top rushing grade in college football over the last two years, and while he’s not the most accurate quarterback on a throw-for-throw basis, Jackson has shown the ability to make big-time throws into NFL windows, and that’s enough to build an offense around at the next level. With QB Carson Palmer nearing the end of his career, the Cardinals look to tap into Rosen’s potential as their quarterback of the future. There’s a Palmer-like boom-or-bust nature to Rosen’s game as he can sprinkle the field with NFL throws while backing that up with head-scratching decisions, but he’s an excellent intermediate thrower and his high-end flashes are as good as it gets in the class. The quarterback run slows down for a bit as the Ravens look to add some juice to their offense with Washington who leads the nation with 464 yards on deep (20-plus yard) passes this season. He has the speed to get behind the defense and improved ball skills have allowed him to make plays in contested situations, a good fit for getting QB Joe Flacco’s career back on track. The nation’s top-graded defensive player at 95.5 overall, Hurst is disruptive against the run and as a pass-rusher. He’s built in the mold of current Bucs defensive tackle Gerald McCoy, but it can’t hurt to have two disruptors up front, especially in the age of multiple defensive fronts and high subpackage usage. Hurst has been dominant in his 1,233 career snaps and an interior havoc-creator is coveted in today’s NFL. Williams has missed most of the season due to injury, but he was one of the nation’s top offensive tackles in 2015 and 2016. Last season, his 91.1 overall grade ranked third in the nation, as he allowed only four total pressures while dominating in the running game. The Bears have a few different ways they can go with this pick, but they upgrade the tackle spot with Williams. Cincinnati has lingering questions at offensive tackle and Brown has shown the ability to pass protect and impact the run game at a high level. He’s given up only 11 pressures on 617 attempts over the last two years and he uses his massive frame to open holes both at the point of attack and at the second level. Brown currently ranks No. 7 overall and No. 2 as a run blocker among the nation’s offensive tackles. The guard position has been a trouble spot for the Dolphins for a while and Nelson is one of the best guard prospects to come out in recent years. He is a dominant run blocker, currently leading the nation with a 94.3 grade, and he’s showed continued improvement in pass protection where he’s only allowed two pressures this season. The outside pass-rush has been inconsistent in Green Bay in recent years but Key adds an explosive threat to the mix. His production is down a tick this season as LSU has moved him around the defense, but when unleashed off the edge, Key brings an explosive threat with his 177 career pressures (21 sacks, 31 hits, 78 hurries). While QB Philip Rivers is still capable of leading a team, the Chargers have to keep an eye toward the future. 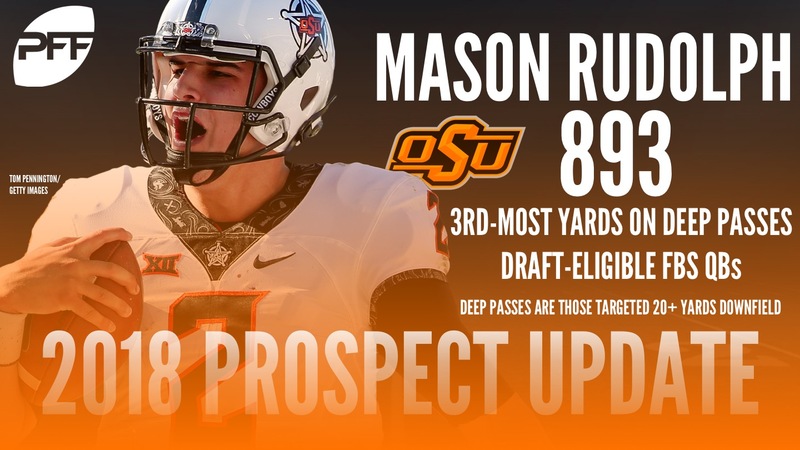 Rudolph has had a productive career at Oklahoma State, he’s shown good accuracy at the intermediate level and his passer rating of 104.3 when facing pressure is third-best in the nation. Ridley may never put up huge numbers is Alabama’s run-heavy system, but his speed is evident on tape and he can be a downfield weapon at the next level. Buffalo has a receiving corps to overhaul and adding Ridley is a good place to start. Detroit needs a running game that can take pressure off QB Matthew Stafford and Guice brings that and more as a dynamic, three-down option. He has big-play ability both as a runner and as a receiver and his 111.7 elusive rating (52 missed tackles forced on 192 touches) in 2016 showed his capabilities. Chubb has emerged from run-stopping edge defender into more of an all-around threat as his career has progressed. His 88.6 overall grade ranks sixth in the nation while his 88.9 grade against the run ranks third, and he brings much-needed youth to the Carolina defensive line. A possible steal at this point in the draft, Fitzpatrick has the versatility to play outside or in the slot at the next level. 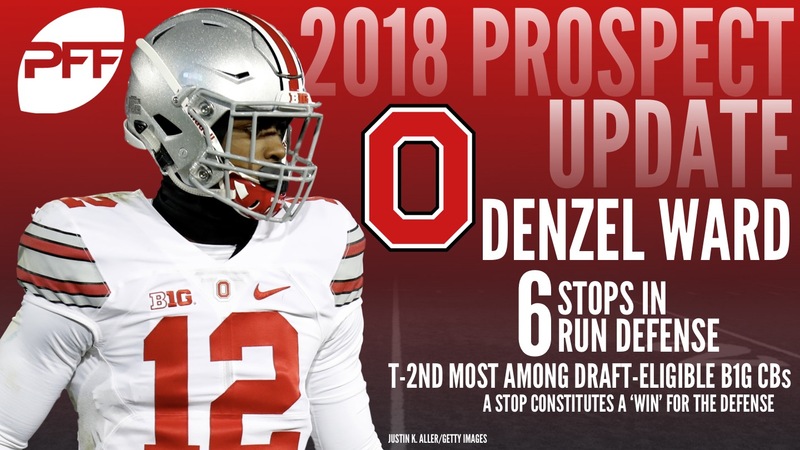 He has a knack for finding the ball, forcing an incompletion on 22.2 percent of his targets in 2016 (14th in the draft class) and he’s a playmaker around the line of scrimmage, as he’s tied for 10th in the nation with 17 stops. CB Bashaud Breeland’s contract is up at the end of the year and even with CB Kendall Fuller’s emergence, the Redskins can use another playmaker in the secondary. Oakland has been looking for more consistent pass-rushing production opposite Khalil Mack and Landry has the burst to make that happen. 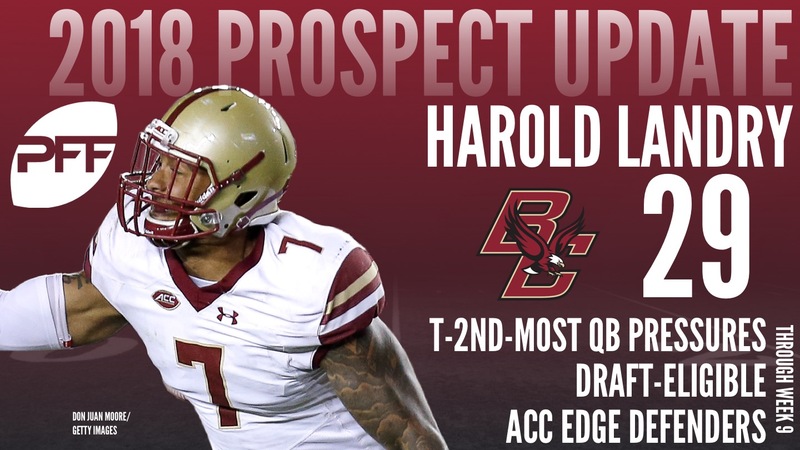 He’s received much more attention this year after ranking third in the draft class in pass-rush productivity a year ago (18 sacks, seven hits, and 44 hurries on 322 rushes), but the talent is there and he’s shown well in the run game throughout his career at Boston College. It may not be flashy to pick an offensive tackle two years in a row, but Denver still has work to do on the offensive line and McGlinchey is one of the best options in the draft. He’s a powerful run blocker at the point of attack and his pass blocking has been strong in his three years as a starter at Notre Dame. McGlinchey has also proven productive at both left and right tackle, adding even more value for the next level. The pass-rush is ready for more firepower in Tennessee and Okoronkwo brings enough burst off the edge to be a difference-maker. He now has 115 career pressures (21 sacks, 25 hits, 69 hurries) on only 612 rushes and he has 330 career snaps playing coverage, adding versatility to a Tennessee defense that can use him creatively. It’s time to load up on offensive playmakers in Jacksonville and Gallup brings athleticism, physicality, and production to the wide receiver position. He’s the No. 1 receiver in the nation at 93.9 overall and he’s shown the ability to win both after the catch and the catch point, both translatable skills for the next level. 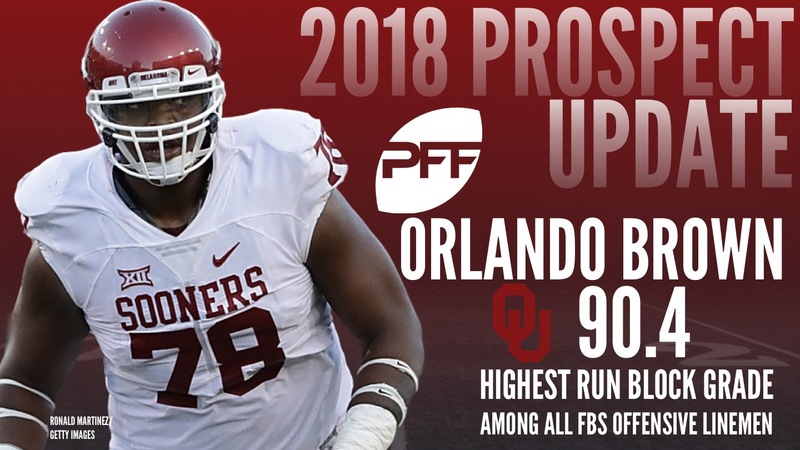 There is still work to be done on the defensive side of the ball in Cleveland and Oliver’s size and athleticism will be coveted at draft time. He has excellent balls skills, leading to 21 pass breakups on only 134 career targets and he’s only allowed 44.8 percent of his targets to be completed in his two-plus years of action. The Los Angeles offensive line overhaul continues with Ragnow, who fits a need but also may be the best center prospect we’ve seen in years. He’s a dominant run blocker, creating holes at the first and second level, and he’s shown well against top SEC competition over the last three years. Before a season-ending injury, Ragnow ranks as the nation’s top-graded center at 93.7 after leading the nation last year as well at 93.4. 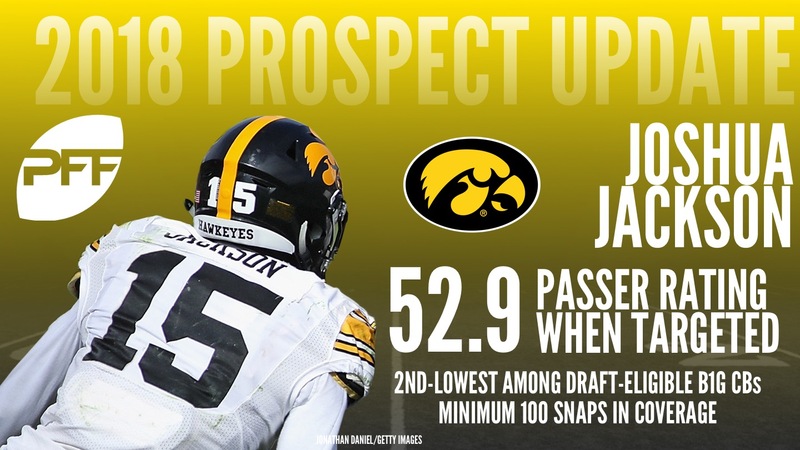 A breakout 2017 season has put Jackson on the radar and even with their cornerbacks locked up for the next few years, his length and ball skills may be too much to pass up for Atlanta. Jackson’s 14 pass breakups lead the nation and he’s now gotten his hands on 23 passes on only 104 career targets. Jackson is a good fit for Atlanta’s system and you can never have too many good cornerbacks in today’s NFL. The defensive overhaul continues in New Orleans, where Evans brings athleticism to the back-seven. He has played both traditional linebacker and on the edge for Alabama, so the versatility is an added bonus, and Evans is just tapping into his potential as he’s played only 719 career snaps. Vea is more than just a space-eating nose tackle as he complements his elite run-stopping ability with the power to push the pocket better than anyone in the country. Vea moves well for 340-plus pounds and he has 61 career pressures on 480 rushes, showing that he can collapse the pocket in must-pass situations. Vea’s 88.9 overall grade currently ranks fourth among interior defensive linemen in the nation. The offensive line has gotten a lot of love from Minnesota the last year or so, but Hernandez may be too good to pass up. There are still questions at guard up front, and Hernandez brings a physical run-blocking presence who has surrendered only two pressures in the last two years. Hernandez posted the top overall grade among guards in 2016 at 95.3 and he’s currently second at 90.5. 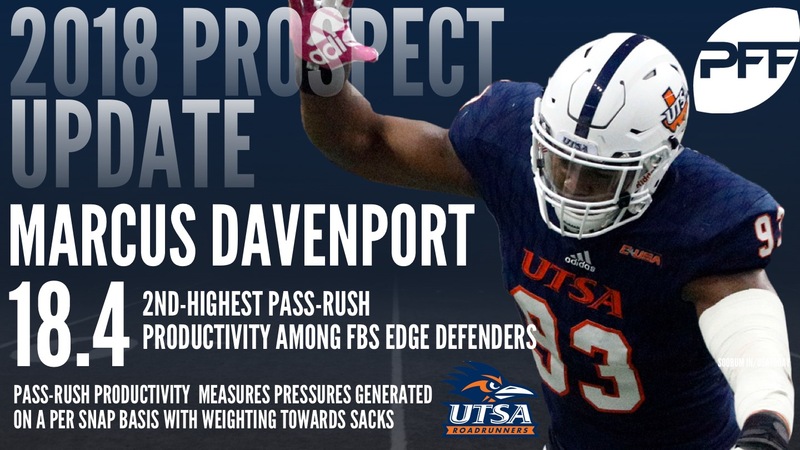 Perhaps a surprise name, but Davenport has great size at 6-foot-7, 255-pounds and he knows how to use it. After two productive years in 2015 and 2016, Davenport is currently No. 5 among edge rushers with an 89.6 overall grade and he’s second in the nation with a pass-rush productivity of 18.4 (eight sacks, five QB hits, 24 hurries on 162 rushes). The Bills add depth up front with Davenport. Adding a large target with ball skills can only help QB Russell Wilson, who likes to give his playmakers an opportunity to make plays. Sutton uses his 6-foot-4 frame to box out smaller cornerbacks and he’s averaged 16.7 yards per reception in his career to go with 27 forced missed tackles on 119 catches over the last two season. Goedert’s athleticism is easy to see, especially when playing FBS competition where he’s shown well when given the opportunity. Goedert is a mismatch creator both in the middle of the field and on the outside, and that’s been a missing piece of the Pittsburgh offense in recent years. With OT Jason Peters getting older and currently out for the season, the offensive tackle position likely needs to be addressed in Philadelphia. Crosby has been productive since stepping in as a true freshman in 2014. This season, his 87.5 overall grade ranks ninth in the nation and he ranks in the top-15 in both pass blocking and run blocking. Ward doesn’t have the desired 6-foot-plus size the NFL covets but he has exceptional speed and he has the quicks to stick with NFL receivers. Ward has allowed only 35.8 percent of his targets to be completed over the last two years while breaking up 15 passes on 81 targets and he can line up either outside or in the slot at the next level. New England will tap into that versatility in their matchup-centric defensive system.